Burma’s President Thein Sein is misusing his power during the current campaign for parliamentary by-elections scheduled for April 1, according to the opposition National League for Democracy (NLD) party led by Aung San Suu Kyi. Under the country's election rules, government officials including the president are barred from representing or campaigning for a political party. The NLD statement, which said the incident was reported in a local journal, did not directly accuse the Burmese president of campaigning for the ruling Union Solidarity and Development Party (USDP). 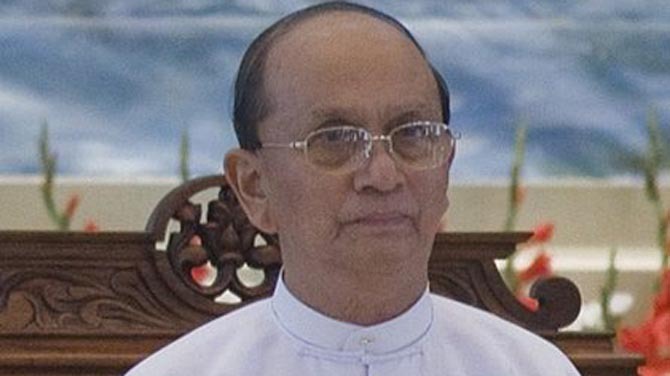 The former army general represented the USDP before he was elected as president of the nominally civilian government last year. In a further statement, released on Friday, March 24, the NLD complained that the authorities have taken no action against individuals distributing pamphlets which carry slanderous attacks against Suu Kyi. The statement said such a lack of action is paramount to encouraging those activities. The pamphlets allegedly state that Suu Kyi must apologize to the people of Burma for having Western governments impose economic sanctions on the country. The USDP and the NLD are the main rivals competing for the vacant 48 parliamentary seats in the upcoming elections. While the ruling government has vowed that the elections will be free and fair, and has this week invited the US and EU to send observers to monitor the polls, the NLD has issued a series of complaints about irregularities on the voters lists, harassment of its party members, and disruption of its campaign activities. The NLD are complaining that dead persons are still listed on the voter registrars in Rangoon and the Irrawaddy Delta while some eligible voters are not listed as voters for the coming elections. Zeyar Thaw, the 32-year-old activist and former political prisoner running as a NLD candidate in Zabbu Thiri Township against a USDP candidate, said Naypyidaw is the most hardened ground for election campaigning and that suspected USDP members destroyed an NLD party billboard in a village in his constituency late last month. In an exclusively obtained audio of a speech by the former Minister of Industry No (1) Aung Thaung—who has now become the government’s top peace negotiator—he was recorded as telling villagers in central Burma a week ago that the USDP party has no members who are former prison convicts, and asked the locals if they wanted to become slaves of the British once again—a thinly veiled attack on NLD leader Suu Kyi who was previously married to a British citizen. This is what happen when leaders in the country do not have good education ..
USDP party leading members like Aung Thaung has no shame and do not have any international standard knowledage, how he dare to stated that Burma will become skave of British. Mr. Aung Thaung must understand that those colonialism days are gone now is globlization world so he must stop and shut up his mouth using such nonsense accusation and require to learn more. last 20 over years & until now same conduction. “We have fulfilled all your needs. Now it’s our turn to ask something in return.” Base on this statement, I don't see any Thein Sein interfering in election because he did not say "Go vote for USDP candidate" or he didn't even mention USDP at all. May be what he tried to say was now that his administration has done a good job, the people should accept his government as a legit government. I won't argue about what other USDP members did, but honesty, I think President Thein Sein is doing a good job compare to his predecessor. "The pamphlets allegedly state that Suu Kyi must apologize to the people of Burma for having Western governments impose economic sanctions on the country"
The things NLD is complaining about happens in elections all over the world. To attacked U Thein Sein on this shows a complete lack of judgement. The opposition hardliners are correct - Burma is not yet a democracy, not by a long shot. But U Thein Sein is trying. And without U Thein Sein, ASSK has nothing. Nothing. If you want to go back to square one (think 2008), then keep complaining. Wasting time and energy on these useless petty craps is all NLD could come out with for millions of faithfuls! This is the action of the clean government members. It is scandal. We have to nurture the attitude of political parties, pride of politicians,distinct role of government from politics. We used to be under one party system, and if we imitate the same practice then it will become disaster again. The parties should respect each other for the sake of country and citizens. "In a further statement, released on Friday, March 24, the NLD complained that the authorities have taken no action against individuals distributing pamphlets which carry slanderous attacks against Suu Kyi. The statement said such a lack of action is paramount to encouraging those activities." That is freedom of expression. If slanderous - ie saying things that are false (bearing false witness) - then take legal action according to the law; sue the culprit. We call SuuKyi ARIS traitor because she is a traitor. She will always be a traitor all her live. If our beloved Bogyoke AungSan were alive, he would have disowned her. Yet, shamelessly she keeps using her late father's picture in campaigning, to mislead our uneducated and gullible people.NLD HAS SO MUCH UNFAIR ADVANAGE IN TERMS OF MEDIA EXPOSURE WITHIN AND WITHOUT BURMA. Not fair! 1. "Under the country's election rules, government officials including the president are barred from representing or campaigning for a political party." WHAT A RIDICULOUS RULE! In any democracy, any member of a party can campaign. THIS RULE MUST BE ABOLISHED! 2. What happens to the love-in? Thein Sein, keep it clean. Burmese 'democracy' cannot be engineered - as the whole world is watching and listening! No surprise chaps. We all know who is the power behind General Thein Sein. Wait for more drma afer the 1st April 2012 elections. Pl remember the Depaeyin Massacre(30 May 2003),the Generals are still there and are the REFORMERS? I have been living in democratic countries for a few decades and am very much involved in politics. However, please teach me why a president can't campaign for his party which is a routine in all democratic countries. People can also bash any political opponents, and even Daw Aung San Suu Kyi. Please don't make her untouchable. If it is true as NLD complained, voter lists irregularities, harassment of NLD party members and disruption of its campaign activities are troublesome though. Anybody who thinks the people in power are willing to relinguish their lucrative roles and positions are stupid and naive at best. Wake up and smell the coffee. Looks like praise of Thein Sein et al are premature and dangerous. If Thein Sein was elected as a USDP member there is no basis for denying him electioneering for his party. Why, the military and the USDP are after all like Siamese twins joined at the belly full of loot. It's the habitual nastiness and coercion inherent in veiled or blatant threats directed to opposition parties and voters alike, as well as misuse of govt funds for their own campaign directly or under the guise of infrastructure development, health and education etc. in the run up to the elections, that cannot be acceptable in any way, shape or form. Come on, the destruction of a billboard is hardly something shocking. It happens everywhere in each and every country. And honestly speaking, Thein Sein is in politics himself and as such may make claims as long as they are not false. The NLD is quite lucky that they are not electable in the USA where agencies are hired to bend the truth.